There's no way to write this post without sounding sales-y, but I promise that nobody told me to write this, and I am in no way being compensated for writing this. (I am including one referral link, but I will point that out later on.) I'm recommending these companies because they are things I use and love and kind of wish I'd known about a while ago. I'm sharing the knowledge up in here, my friends. Get ready. I've recently been keeping a running list of different rewards programs and such that I use regularly and think are worth sharing. Since going from a two-income household to a one-income household a couple years ago, I have been trying to take my thriftiness to new levels. Every little bit ends counts, you know? I know I love hearing when these sorts of things work for "real" people, so I thought I'd share some of my experiences. 1. Swagbucks — I've been hearing about Swagbucks for a while now, but finally signed up last month. I honestly didn't think I'd get any benefit from it, but have been pleasantly surprised. 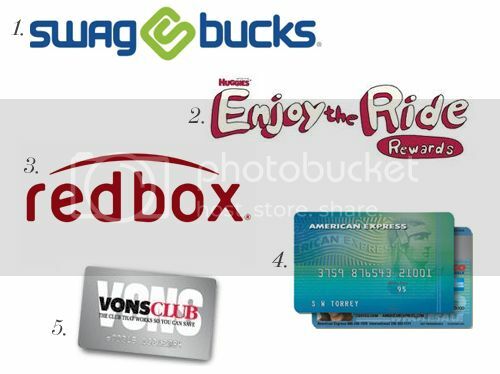 (Full disclosure: This is my Swagbucks referral link. See? I don't lie. Except in regards to cookie consumption. Because, really.) I've had my Swagbucks account for less than a month and have already earned $45 in Amazon gift cards. I had no idea I could make that much money. I earn the most Swagbucks doing surveys (I try to do one per day, sometimes more, if I have extra time). When I'm doing things online, I also use their search engine, which rewards you periodically with extra Swagbucks. My goal is to hoard these gift cards to use for buying Christmas/birthday gifts throughout the year. 3. Redbox text alerts — You can sign up for Redbox text alerts to receive texts with free rental codes each month, as well as .50 discounts that they send every week-or-so. Jay and I are each signed up, so we know we'll be getting at least 2 free rentals each month (sometimes Redbox sends extra freebies each month, too). Totally worth it, you guys. And they aren't spammy at all. 5. Vons fuel rewards — Yeah, you're totally tired of me mentioning Vons, but I'm not going to talk about couponing this time. (At least, I hope not. No promises.) Vons offers fuel rewards that you earn on each purchase, based on how much you spend. There are times they offer 2x (or more) fuel rewards that you can add to your card through their just for u page. This month I was able to get 9 fuel rewards, that equaled .90/off per gallon (you can use up to $1/off once you've earned 10+ rewards). You do have to fuel up at a Vons/Safeway gas station to use that many fuel rewards (or you can use up to .20/off per gallon at certain Chevrons), but I find that going to the Vons gas station totally worth it, because I filled up my tank for LESS THAN TEN DOLLARS. What. I clicked on your referral link to swagbuck and I signed up! It sounds a little similar to mypoints which I used awhile back but I kind of just stopped eventually. I did get a few giftcards from mypoints for starbucks or target though, so maybe you would be interested in checking them out too. Instead of Vons, we have Safeway. I love their fuel rewards! Last week, they had a deal where if you spent $90 worth, then you can get 9 fuel rewards! Or something crazy amazing like that anyway. I get my gas from Chevron though, there aren't any Safeway gas stations nearby unfortunately. Let me know if you want any other tips for Swagbucks—I'm thinking of posting a few things I've learned over the past month that have really helped. But definitely let me know if you need any advice or have any questions! I'm still floored by how many gift cards I've been able to snag so far. Blows my mind. I use my Costco Amex card the exact same way (always pay off credit card at the end of the month, earn huge cashback at the end of the year!)... hooray! :) So awesome! Thrifty ladies unite! :) I've been using credit cards this way for so long that if I ended up paying interest even for one month, I'd feel so stressed out. Ha! Ahhhh, I've seen #1 pop up everywhere and with great results AND I have an account AND I need extra cash/gift cards like whoa and I don't dedicate enough time. Gotta start! Also, are you a member of Recycle Bank? I totally, 100%ly recommend them! Basically, you learn about going green and recycling and living healthier (is any of this a bad thing? I think not) and you get rewarded points. It's SO easy. With the points, you can grab a coupon here or there however I go for the gift cards and there are year. long. magazine. subs. I just signed up for Real Simple and I am so excited because I've wanted that magazine for so long but it's kind pricy. I'm throwing my referral link up here. ;) https://rcycle.it/yv3tj <- boom! As far as Swagbucks, I definitely recommend using the search bar to search for anything you'd usually Google throughout the day. (Even searching for sites you already know the address for, just so you can have a chance at earning extra bucks.) And the surveys are where it's at, truly! That's how I've earned most of my Swagbucks. Be sure to fill out all the profiles on the right side of the survey dashboard—I think that's the best way to be offered surveys that you will actually be able to complete, because they will already have most of the information about you and your "demographic". I have never heard of Swagbucks before, but I'm going to check this out!! I always love to save money, and I'm so glad you did a post on this! Sweet! I totally get excited when you share your tips with us for saving. I'm gonna go check out swagbucks through your link now, thanks! I've been hearing a lot about Swagbucks and never really believed I'd make much from it, but this may have swayed me. I may actually try it out now!